Speaker of the House of Commons John Bercow will join hundreds of Stonewall supporters on the tenth annual Brighton Equality Walk on Bank Holiday Sunday 5 May. The 10k Walk raises funds for Stonewall’s Education for All programme, which helps schools tackle homophobia to create a safe and supportive environment for children from all families. Bercow has a long history of supporting gay equality and Stonewall. Along with wife Sally he raised over £1,300 by completing the Walk in 2012, and cut the starting ribbon while describing Stonewall as “one of the most successful campaigning organisations in British political history”.They also attended Stonewall’s 2012 Equality Dinner, which raised nearly £400,000 for anti-homophobia work. 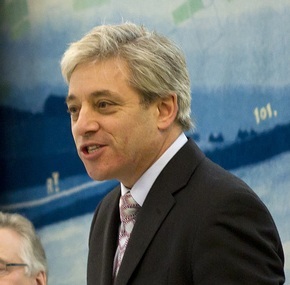 Bercow has set up a JustGiving page for people who wish to support him in the walk. He will be joined by celebrity host Zoe Lyons at the Equality Walk’s starting line. Celebrity Big Brother winner Rylan Clark and X-Factor favourite Lucy Spraggan have also lent their support to the event, which attracted over 570 Walkers in 2012. John Bercow is the honorary leader of Kaleidoscope Trust, a gay rights group that was created to champion the rights of gay and trans people around the world. The Speaker has been a vocal supporter of gay rights, and, after being elected to his position, he adopted a coat-of-arms with multiple symbols of gay equality. To find out more and register for the Brighton Equality Walk call 020 7593 1875 or go to www.equalitywalk.org.uk.